If there is one thing I retained from high school chemistry, it’s that you measure the meniscus of a liquid—and that base burns are far sneakier than acid burns. Back then, no one mentioned that my future understanding of brewing science would vastly benefit from retaining a little more than the gossip of my first period chemistry class. Still, I was able to hold on to a few of the most simple of scientific procedures, like you must look at the bottom of the bendy-thingy when measuring a liquid. Since I enjoy masquerading as a brewer from time to time in my garage, this basic rule of measuring has proven valuable as it’s a very important part of the seemingly never-ending variables when brewing: gravity. You may have never heard the term gravity as it relates to brewing; you’re likely more accustomed to Newton’s version. That gravity’s cool too—it keeps beer in your glass and everything from spinning off into space—but perhaps you’ve noticed a gravity reading on a beer label or tap list and not known what it was. A gravity reading refers to the total amount of dissolved solids in water, since we’re talking about beer, those dissolved solids are sugars. These sugars are consumed by yeast to convert the wort (unfermented ingredients) into beer. It’s read as a sequence of numbers that starts with the number one followed by a decimal to the thousandth place, something like this: 1.052. A gravity reading taken just prior to yeast being added, or pitched, is referred to as the original gravity (OG). The OG will provide the brewer with a good idea of the potential alcohol percentage for that particular beer. For example, the OG of an imperial stout at 1.080 (read: ten-eighty) has more sugar molecules to be converted into alcohol than an ordinary bitter at 1.032 (say it like this: ten thirty-two), this explains why the stout will pack more alcohol (~8.0-12.0% ABV) than the bitter (3.2-3.8% ABV), and why more malt is needed in the imperial stout recipe than the ordinary bitter recipe. The OG reading is very important to the execution of the brew and subsequent fermentation of the beer. Brewers will track the specific gravity (SG) for the duration of the process to make sure that the gravity levels remain consistent from one batch to the other and that no problems arise from the malt quality, brewing process or yeast productivity. If you’ve ever purchased a homebrew starter kit, you’ve likely received among other items, a clear plastic tube with an oversized thermometer-looking-deally (that’s the last time, swear) with incremental hash marks called a hydrometer. A hydrometer, also known as a saccharometer, is used to measure SG as it compares to water, which has a SG of 1.000. 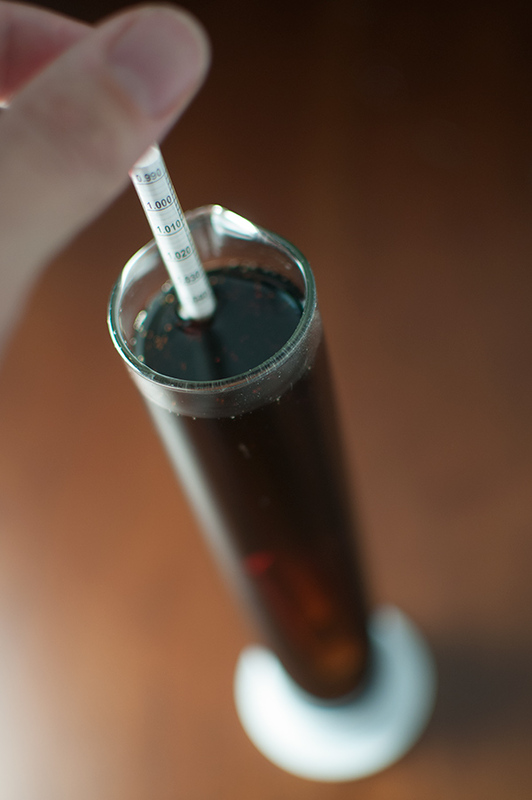 The more dense the solution, the higher the hydrometer will float, showing a reading above 1.000. For example, with a hydrometer reading of 1.052, the numbers to the right of the decimal (52) are the gravity units (GU). Read simply, the density of the wort is 5.2 percent higher than that of water. As yeast works to consume the sugar, the density of the wort is decreased, which causes the hydrometer to deliver a reading closer to 1.000. While gravity can be measured on different scales—Balling, Plato and Brix—Plato (which has nothing to do with the philosopher) is often used by brewers. On a beer label, Plato is usually provided along with the OG, here’s an example: OG: 1.080 | 20°P. Notice that you can approximate Plato by taking 1/4 of the gravity units. Different fermentables—rye, barley, honey, fruit, maple syrup, etc.—yield different increases in gravity, due to the varying amounts of fermentable sugar found in them. For instance: two-row malted barley will not provide as large an increase in gravity as table sugar because the table sugar is fully fermentable whereas two-row is not. 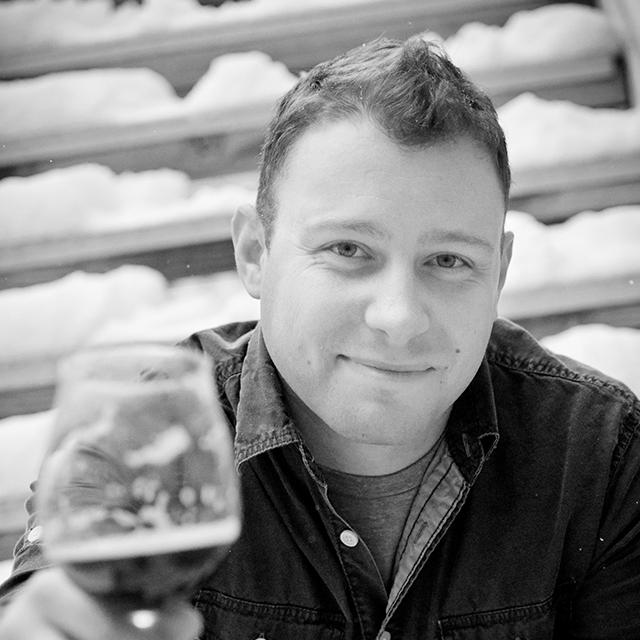 Knowing the amount of fermentable sugar in different ingredients allows brewers to figure out how much of each fermentable will achieve the desired OG of the beer. Both brewers periodically check the gravity throughout the boiling of the wort. O’Harrow uses a refractometer (a similar density measurement tool that employs the Brix scale), while Seibt employs a trio of saccharometers with varying scales, to ensure accuracy. During fermentation each brewer will take readings, generally every other day. Provided that gravity readings check out, or steps are taken to adjust inconsistencies, brewers then look for healthy and cooperative yeast to drop the beer’s gravity to a specific range decided upon by the brewer or to match the style, this gravity is called final gravity (FG). The difference between OG and FG will reveal the apparent attenuation—the percentage of fermentables that were successfully converted to sugars. While gravity is important to a brewer, beer fans can benefit from understanding it too. As a beer enthusiast, an understanding of gravity will help you make informed decisions when choosing a beer if styles are not provided. You can infer that a stout with an OG of 1.080 likely has a stronger ABV than a stout at 1.044. A craft beer described as ‘high gravity’ is referring to the strength in alcohol, a detail that adds to the beer’s character. As we continue to expand our ability to describe beer and understand brewing, details such as these aid in both aspects. You might even catch the bug to brew your own beer—dipping your toes into the the hobby of homebrewing. If so, visit my friends at HomebrewersAssociation.org. New homebrewers may not be able to hit target gravities on their first brew, but taking a gravity reading and seeing a change during the fermentation period is certainly a good start! At the very least, you know you were able to provide a conducive environment for yeast to convert sugar to alcohol. But for that, you’ll need to know what a meniscus is.